If you want some jolly little neighbours for the summer, invite the wrens to live near you year after year by putting up small, one-family box-houses under the eaves of the barn, the cow-shed, or the chicken-house, on the grape arbour or in the orchard. Beware of a pair of nesting wrens in a box nailed against a piazza post: they beat any alarm clock for arousing the family at sunrise. Save the starch boxes, cover them with strips of bark, or give them two coats of paint to match the building they are to be nailed on. Cut a hole that you have marked on one end of each box by drawing a lead pencil around a silver quarter of a dollar. A larger hole would mean that English sparrows, who push themselves everywhere where not invited, would probably take possession of each house as fast as you nailed it up. Of course the little one-roomed cottages should have a number of small holes bored on the sides near the top to give the wrens plenty of fresh air. Have the boxes in place not later than the first of April—then watch. Would it not be a pity for any would-be tenants to pass by your home because they could not find a house to let? Wrens really prefer boxes to the holes in stumps and trees they used to occupy before there were any white people with thoughtful children on this continent. But the little tots have been known to build in tin cans, coat pockets, old shoes, mittens, hats, glass jars, and even inside a human skull that a medical student hung out in the sun to bleach! When you are sound asleep some April morning, a tiny brown bird, just returned from a long visit south of the Carolinas, will probably alight on the perch in front of one of your boxes, peep in the doorhole, enter—although his pert little cocked-up-tail has to be lowered to let him through—look about with approval, go out, spring to the roof and pour out of his wee throat a gushing torrent of music. The song seems to bubble up faster than he can sing. “Foive notes to wanst” was an Irishman’s description of it. After the wren’s happy discovery of a place to live, his song will go off in a series of musical explosions all day long, now from the roof, now from the clothesposts, the fence, the barn, or the wood-pile. There never was a more tireless, spirited, brilliant singer. From the intensity of his feelings, he sometimes droops that expressive little tail of his, which is usually so erect and saucy. 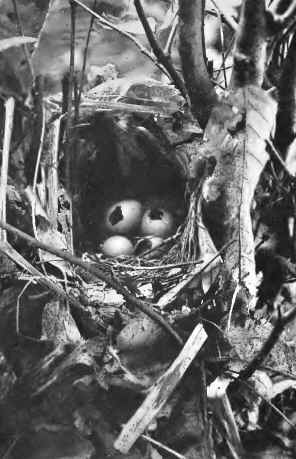 Another tragedy of the nests: what villain ate the catbird’s eggs? If you fancy that Jenny Wren, who is patiently sitting on the little pinkish chocolate spotted eggs in the centre of her feather bed, is a demure, angelic creature, you have never seen her attack the sparrow, nearly twice her size, that dares put his impudent head inside her door. Oh, how she flies at him! How she chatters and scolds! What a plucky little shrew she is, after all! Her piercing, chattering, scolding notes are fairly hissed into his ears until he is thankful enough to escape. There’s a little brown wren that has built in our tree, And she’s scarcely as big as a big bumble-bee; She has hollowed a house in the heart of a limb, And made the walls tidy and made the floors trim With the down of the crow’s foot, with tow, and with straw The cosiest dwelling that ever you saw. This little brown wren has the brightest of eyes And a foot of a very diminutive size. Her tail is as trig as the sail of a ship. She’s demure, though she walks with a hop and a skip; And her voice—but a flute were more fit than a pen To tell of the voice of the little brown wren. One morning Sir Sparrow came sauntering by And cast on the wren’s house an envious eye; With a strut of bravado and toss of his head, “I’ll put in my claim here,” the bold fellow said; So straightway he mounted on impudent wing, And entered the door without pausing to ring. An instant—and swiftly that feathery knight All towsled and tumbled, in terror took flight, While there by the door on her favourite perch, As neat as a lady just starting for church. 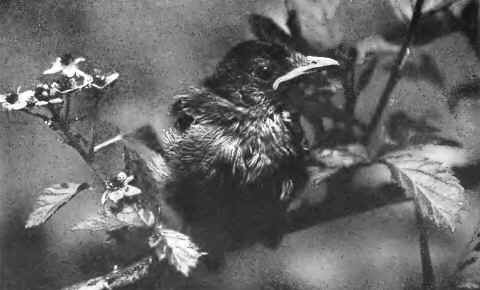 With this song on her lips, “He will not call again Unless he is asked,” sat the little brown wren. If the bluebirds had her courage and hot, quick temper, they would never let the sparrows drive them away from their boxes. Unfortunately a hole large enough to admit a bluebird will easily admit those grasping monopolists; but Jenny Wren is safe, if she did but know it, in her house with its tiny front door. It is amusing to see a sparrow try to work his shoulders through the small hole of an empty wren house, pushing and kicking madly, but all in vain. What rent do the wrens pay for their little houses? No man is clever enough to estimate the vast numbers of insects on your place that they destroy. They eat nothing else, which is the chief reason why they are so lively and excitable. Unable to soar after flying insects because of their short, round wings, they keep, as a rule, rather close to the ground which their finely barred brown feathers so closely match. Whether hunting for grubs in the wood-pile, scrambling over the brush heap after spiders, searching among the trees to provide a dinner for their large families, or creeping, like little feathered mice, in queer nooks and crannies among the outbuildings on the farm, they are always busy in your interest which is also theirs. It certainly pays, in every sense, to encourage wrens.